Oh, you adorable two. Have a wonderful Thanksgiving! Happy Thanksgiving week to you too. So beautiful and thoughtful. 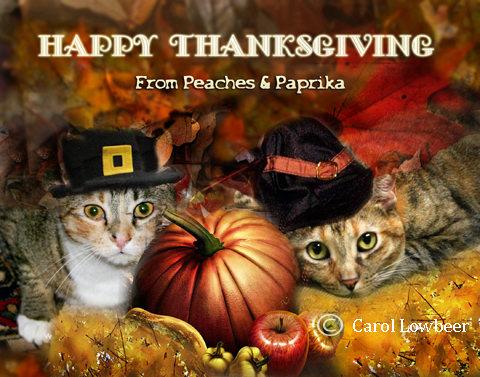 Thank you for your friendship and all that you do, Peaches, Paprika, and mom Carol! That's really beautiful! Happy Thanksgiving to you all! Aww ... so much cuteness! We wish all of you a Happy Thanksgiving as well. What a beautiful piece of art to celebrate Thanksgiving! We wish you a very happy Turkey day! Have a purrfect turkey day week! Happy Thanksgiving! Enjoy! Beautiful art.